When it comes to food, portion size matters. When it comes to pasta portions, choosing the right size is key to unlocking the benefits without overindulging. It can be hard to know how big is too big when it comes to pasta portions. 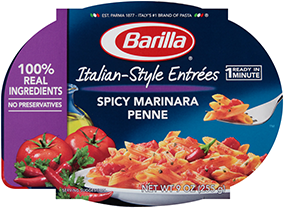 Let Barilla help you figure out what is the right amount! Use this handy visual guide to quickly and easily assemble a perfectly portioned nutritious pasta bowl for one. You'll find it's not as complicated as you think, and in fact, portioning pasta and other lean proteins for your next dinner idea can be fun! For more specific Mediterranean pasta dish inspiration, check out our healthy pasta recipe builder. If you think avoiding all pasta dishes is good for your diet, think again. According to new pasta research, eating proper pasta portions the Med way—as part of a healthy and balanced traditional Mediterranean-style diet—may improve your diet quality by over 20 percent, compared to not eating pasta at all. So, take a page out of the Italians’ book and enjoy your pasta tossed with other healthy ingredients, such as vegetables, beans, lean proteins, olive oil and herbs. We've got you covered in this department All of our traditional pasta recipes and Passion for Pasta recipes are properly portioned for you, so long as you share with your friends and family as prescribed! Not only can pasta portioning improve your diet, but it can add spice to dinner parties and feed all of your guests.